The chances are you'll find one from DoubleClick. The problem is that sites have started to 'share' cookies, this can happen if a site such as AltaVista after a search requests information DoubleClicks server, a cookie from DoubleClick (called a third-party cookie) could store what you searched on AltaVista (given that AltaVista and DoubleClick have a 'special agreement' - which indeed they do). Any other sites that have this agreement with DoubleClick could all share information without your knowledge, the information will most likely be used for advertising purposes. But of course any company willing to do business with DoubleClick would create an invisible link between you the DoubleClick server. I say invisible as the chances are you've never visited Doubleclick.net yet most users have their cookies stored on their system without their knowledge. 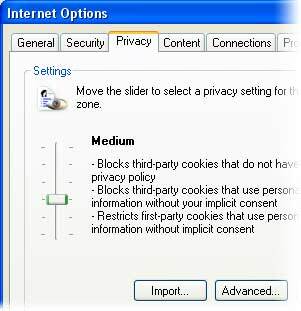 If you're using Internet Explorer 6 then you can go to the 'Internet Options' screen and then click on the privacy tab. Here you can set the privacy settings from accepting all cookies to rejecting them all. You might also be interested in the security tab, if you go to 'restricted sites' and click the button you can block individual sites separately. For example add *.doubleclick.net to block DoubleClick using cookies on your system. IESPYAD - A Page Containing a file which automatically adds thousands of known nasty sites to your restricted sites list. This can be very useful. Nirsoft - This site contains extremely useful cookie management software called IECookiesView as recommended by one of our readers.